Please be aware that Territorial Savings Bank will never send an unsolicited email, text message, or phone call asking customers for their personal or account information. If you are a recipient of such an email or text message, do not respond to the email, text message or click on any links or attachments contained within. Delete the email or text message immediately and contact Territorial Savings Bank’s Electronic Banking Services at 808-946-1400 for assistance. If you receive a phone call, do not respond to the caller and hang up. Obvious typos and other errors. Be on the lookout for typos or grammatical errors, awkward writing and poor visual design. Offers that sound too good to be true. Be wary if the email asks you to fill out a customer service survey in exchange for money, then ask you to provide your account number so you can receive the money. Request for personal or information. Never reply in an email with any personal or account information such as your Social Security Number, Debit card number or PIN. Reminder: If you do not know the sender, DO NOT open the email and DO NOT click on any links or attachments. If the email mentions your accounts at Territorial Savings Bank, you may call us to verify the legitimacy of the email. Safe Online Banking brochure (PDF) provides simple tips to protect your assets and identity, information on cyber-frauds, tools and resources available for victims. Learn about computer security, how to avoid and detect virus and spy ware, and more at OnGuardOnline.gov. This site is managed by the Federal Trade Commission in partnership with other federal agencies. 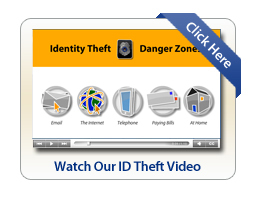 tool that consumers can use to learn how to better protect their computers and themselves from identity thieves. The presentation also features actions consumers can take if their personal information has been compromised. Helpful tips for using mobile payment services and avoiding risky mistakes. Learn more from the Consumer Financial Protection Bureau. Learn more about Identity Theft and resources on how to protect yourself from being a victim from the Federal Trade Commission.